"Born April 14, 1946, the first son of newly married Jesse and Clara Clark, Lewis started singing at the tender age of 7 after hearing his mother and father sing Gospel. He knew right then that he wanted to be a singer and cut a record someday. A year later Lewis's grandfather George Odom introduced him to the guitar and the race was on to be the next Little Richard or Chuck Berry. In High School, Lewis started his own shoe shine business eventually landing a job at Magnolia Shoe Shine in downtown Tampa. At 17 he secured a job at the Hillsborough Hotel. Coupled with his shoe shine hustle, he managed to save enough money to get his first record cut. "Come With Me" with a flip side of "If You Ever Leave Me." Selling to friends and hotel patrons he quickly sold out of the 200 copies. With a $105.00 investment the mere $95.00 profit would not deter this would be artist determined to make his mark in the music world. 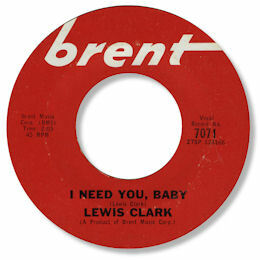 1966 began with a fresh cut from Lewis Clark "I Need Your Lovin So Bad" B/W "Let's Do It Now" playing day and night throughout the Clark household. This was immediately followed by the soulful ballad Here's My Heart with a flipside version of the earlier cut "If You Ever, Ever Leave Me". On the heels of this success Lewis was given a regular gig at Dino's (an all White Club) on Dale Mabry playing with the likes of Mike Pinaro. He quickly became a household name in White Clubs around Tampa Bay. In the Summer of '67 Lewis followed up with his biggest hit to date "Dog(Ain't A Man's Best Friend)" receiving airplay in Cleveland, Detroit, Houston, and Atlanta. With a little regional exposure and the promise of a national spotlight on the horizon Lewis Clark decided to respond to the call of Black Youth of his day. When the entire nation was submerged in racial turmoil, Lewis bridged the color line bringing his brand of rhythm and blues to predominately white audiences. As colored youth chanted Black Power slogans Lewis went back into the studio to cut his answer to the color problem: "Green Power". Catching the eye and ear of Otis Redding at a concert at the Fort Homer Hesterly Armory in Tampa, Lewis decided to drive up to Macon, Georgia two days later to meet with the Great Otis Redding at the Redwal Corp. (Otis's publishing company with the likes of Betty Swan and Sam and Dave). During the meeting, Otis agreed to become Lewis's manager, however Redding was tragically killed in a plane crash two months later and with him went the big time dreams of musical success of Lewis Clark. 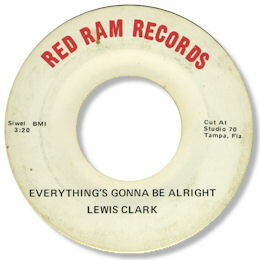 In 1968, Lewis released one of the best songs of his career: "The Great LA Earthquake". 1975: "Heaven on the Countryside". 1976: "Welfare Line" and 1977: "We So Po". During the late 70s Lewis was attracted to the arts scene starting to take hold along 7th Avenue in Ybor City. For the entire 1980s he did gigs at the Blues Ship, Speedy Brown's, Carmines, Frankie's Patio, and occasionally at the annual Gasparilla Parade. In the early 1990s, he was accepted as a member of the Gulf Coast Blues Society playing weekly on Monday nights at the Green Iguana in South Tampa. After several moderate illnesses, Lewis Clark suffered a major stroke in February 1999. He went into a coma and was not expected to live. However, after days of round the clock bedside vigils by family he awoke and pulled through. Though he suffered some permanent damage from the stroke he made a comeback at the Green Iguana in July 1999..."
Sadly I believe that Lewis never recovered from the stroke and has passed away - but I do not have any further details. 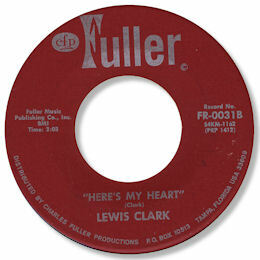 A lot of Lewis Clark's recordings are uptempo and both "I Need You Baby" and "I Need Your Lovin' So Bad" have attracted the DJs and dancers attention. 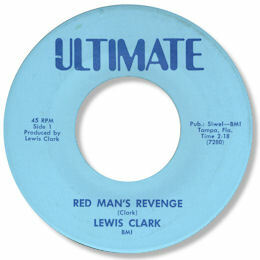 The later - and rather odd - "Red Man's Revenge" is a forthright condemnation of smoking. 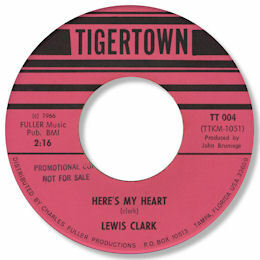 But for this site the two key Clark tracks are his two versions of his own composition "Here Is My Heart". The Tigertown cut was the earlier one and it has a much simpler form. Only a rhythm section backs Clark on this tuneful deep ballad. His voice is pretty well throttled back but the purity of his tone harks back to the earliest days of soul - doo wop even. The Fuller cut is taken at a brisker pace and Clark is much more upfront in his interpretation. The horns add some fine tonal colour and the production values are considerably higher. I like both of the cuts very much - everybody will have their own favourite. UPDATE ~ Dante Carfagna (see Links) has very kindly sent me two additions to the discography - the first 45 on Tigertown and the first Ultimate 45 as now shown below. I'm always grateful to Dante for taking the time/trouble to improve the accuracy of these pages. NEW UPDATE ~ Thanks to Alan Wheway for the update to the discography. Lewis sang lead vocals on two tracks - "Woke up this morning" and People get ready" - on Sarasota Slim's "Live Bootleg" CD from 1995. Clark sang seven songs accompanied only by his own guitar - "Stagger Lee", "What a wonderful world", Great LA earthquake", "Charlie Brown", "Along came Joe" , "Everything's gonna be alright", "Down in the ghetto". 1. I have been unable to locate some of the tracks mentioned in the biography, such as the 1968 version of "the great LA earthquake" or the later "heaven on the coutryside". If anybody has details on these recordings - or any other not incuded in my discography please get in touch. I think it very unlikely that "the great LA earthquake" would have been recorded in the 60s as the event only occurred in 1994 and Clark introduces it on the 10" LP as a "new song". 2. Special thanks to Kelly Benjamin and to Kamau Lahrih Clark. 3. 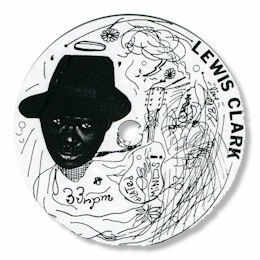 The Lewis Clark who made gospel 45s for the Norman label out of St Louis, MO is a different artist.